Here’s an incredible free learning opportunity for fundraisers – especially if you’re looking to earn CFRE credits – and you won’t even have to leave the comfort of your own home or office to take part! 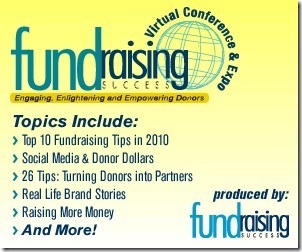 Fundraising Success magazine presents the first-ever Fundraising Success Virtual Conference & Expo 2010 (#FSVCE). To get the most out of this opportunity, be sure to download the Agenda (PDF) and Attendee Success Kit (PDF) in advance. And even if you aren’t able to attend, do take a few minutes to look at these materials – the virtual conference may very well be the future of networking and professional development events, as travel costs continue to rise and nonprofit resources are ever more stretched.